Property Details: 2 Bedroom, 1 Bathroom Vacation Rental, sleeps up to 4. Billy's Blue Heaven condo, beach resort home in Key West. Billy's Blue Heaven is fresh, clean and pristine. A two minute walk to Duval Street and only 300 steps to the world famous Ricky's Blue Heaven Restaurant. The balcony overlooks Truman Annex's lush landscaping beside the shared swimming pool. A short walk or bike ride to Fort Zachary Taylor State Park and Beach, one of the best beaches on the island. You are a moments walk from Mallory Square where sunset is celebrated every day with world class street theater. The condo is outfitted with a washer/dryer, fully equipped kitchen, pots & pans, towels & linens, central air conditioning, off street parking pool with close beach access. A unique feature of this property is bicycles! You don't have to rent. Key West is only two miles by four miles, so nothing is very far away. 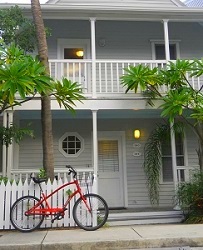 Fly into the Key West airport and take a cab to Truman Annex You have bicycle transportation throughout your vacation. Big baskets on the bikes will make shopping easy too! The kitchen has a Blender. Your bathroom has a newly remodeled freshly tiled walk in shower with 2 shower heads, a rain water and hand held sprayer. One bedroom has a queen bed the second bedroom has two twin beds. Gorgeous decor includes home theater sound system, flat screen TVs, DVD, and CD player. Billy's Blue Heaven Condo Rental in Key West FL.